Face it, your slippers are one of your favorite and most comfortable pair of shoes. I myself can not wait to get into my soft and comfy slippers after a long day, particularly when it is winter time. This is where the comfy winter time Bootie slipper comes in, and in addition to that, spending leisure time in slippers, I have noticed that many have very slippery outsole, particularly when you have tiled floors. I would highly recommend a Bootie Style slipper for winter time and cold weather, generally speaking, these are the times when we mostly reach for a pair of cozy slippers. The Bootie style keeps your feet and ankles warm and comfortable while offering good support. Along with a durable rubber outsole, offering good slip resistance, you can wear your Bootie Slipper indoors and outdoors. Let’s face it, your slippers are a crucial pair of shoes in your wardrobe, and there is no greater joy than putting on a warm and cozy pair of slippers after a long day. 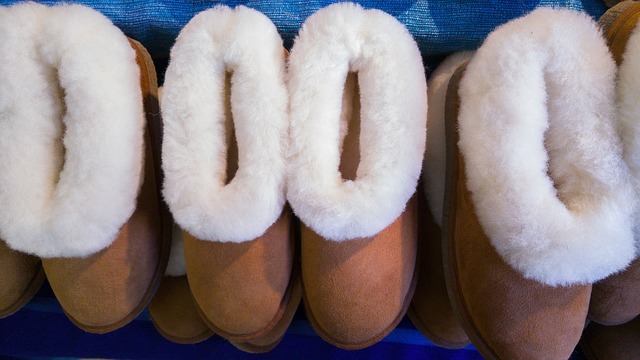 We have all heard of, seen or even maybe own a pair of UGG boots, these are usually made from sheep leather, with shearling wool on the inside for warmth and comfort. They can be used as slippers or even for everyday leisure wear and are one of the most comfortable slipper style booties around. The Open Heel and Closed toe Booties style slipper are likewise quite popular as it offers the plush warmth and comfort of a boot, with an open heel for easy slip on and off. These style slippers usually come with smooth leather or fabric outer and plush fleece or wool lined inners. Similar to the UGG boot, this slipper features an ankle length or higher top, with either fleece or wool lined inners and smooth outer, as well as a durable rubber outsole. Easily washable, keeping in mind that genuine suede leather and shearling is not washable and has certain maintenance procedures. A durable rubber sole so that you can wear your boot indoors and outdoors. Cushioning and support, for comfort. The right material is critical! Leather and Suede are durable and warm, whereas cotton is also warm but more breathable. Synthetic materials, on the other hand, are much more affordable. Make sure that you get the correct fit, most slippers feature a wider fit which may be a problem if you have narrow feet. A shearling lining is one of your best options for cold weather, and is naturally moisture wicking. Other linings such as wool, fleece or fabric are likewise acceptable and comfortable. One of the top rated and most sought after Winter comfort and leisure boots are the UGG boot, which in turn makes a lovely slipper boot for which there is no comparison. Features 100% Twin-face sheepskin and suede upper leather construction, with warm and cozy Shearling inners. A Treadlite durable and high traction outsole that is ideal for outdoor and indoor wear, which is likewise, very lightweight. Pre-treated leather outer that is stain and water repellent. Features the classic ankle high version with twin-face sheepskin, and nylon binding for long lasting durability. Available in some fun and funky colors such as pink and purple, as well as some lovely neutral colors. This is a highly comfortable long length Slipper Boot that is perfect for indoor and outdoor wear, with a warm and cozy fleece lined inner for those cold winters. Available in two-tone colors and some very funky patterned design and color options to choose from, such as the Buffalo Check, Camo and Red Cable-knit texture and patterns. A 13 Inch shaft that will keep your calves and ankles toasty warm. Features a sock comfort slouchy fit with a micro-fleece lining on the inside. The durable rubber outsole offers excellent traction, and durable wear for both indoor and outdoor use. Contrasting color designs, with breathable uppers that are either in wool, Berber, faux or knit blend option. Very flexible and soft, with a multi-layered memory foam, cushioned insole and footbed, for full support and comfort. Offers a therapeutic fit and support. Machine washable, and quick to air dry. The suede toe and heel guards along with the rubber outsole ensure excellent durability and skid-resistant long-lasting wear. Very versatile to wear for both leisure time at home, and a quick trip outdoors. A highly cozy and comfortable Sherpa lined, short Bootie Slipper, ideal for both indoor and outdoor use. Features a very durable and high traction rubber outsole, that is ideal for all surface types. A Top quality faux fur bootie slipper for cold winters. Sherpa fur lined inner for cozy warmth, and a smooth outer available in; GREY, CHESTNUT, BLACK, BROWN, WINE, NAVY and BURGUNDY, color options. Short Bootie that will complement any outfit, and can be worn as a slipper with your favorite warm pajamas. The footbed features therapeutic and comfortable memory foam. A perfect fit with many size options available. Not Uite a Boot but similar in style with the extra feature of easy slip on and off. I thought this one would be a good option to add for those of you who want a lower style with and open back, that is still warm and cozy. Luxury suede uppers with a simple and elegant design. There is a faux fur velveteen lining that is soft, warm and comfortable, as well as highly breathable to keep your feet dry. The Half Back heel design, is easy to slip on and off. A thick memory foam insole that keeps its shape while offering superior comfort and support. The anti-slip TPR rubber outsole is strong and sturdy, while offering excellent slip resistance. Easy to wash by hand and quick to air dry. Available in solid; BLACK, GRAY, NAVY BLUE, and PURPLE, colors for you to consider. Yet another exceptional model from UGG, the Alena is a shorter slipper boot with thick fur linings and a gorgeous chocolate brown suede leather outer in a Moccasin style with stunning finishing. Manufactured from high quality pure sheep leather with a Suede outer and Fur inner lining. Features a stunning Moccasin design in a dark chocolate brown, with a fixed leather bow and a collar that can cuff. There is 17 mm of thick and plush UGGpure wool lining, for comfort and cozy warmth. Completely water resistant outer suede leather.